Tablets are popular for use in hospitality situations because they are slim, mobile when needed and well suited for interaction. However, this also means the tablet is often ‘left alone’ in a public or semi-public space. Not to worry: Gripzo’s tablet enclosures are ideal as a tablet lock or tablet security bracket to keep it safe from theft. Gripzo tablet security grips are suited for tablets of any size. Gripzo offers two sets of grips, standard or XL grip sets. Please check our tablet page for the grip set size you need. Need connection to the network? Tablets used for hospitality will also need connection with the network in almost all cases. This is not a problem with Gripzo tablet enclosures. Through the open design Wi-Fi, 3G, 4G or Bluetooth signals will connect seamlessly to a tablet locked in the tablet grip enclosure. Quick release of the tablet for demonstration or moving around with the tablet in case of charging is done within seconds by means of security key. 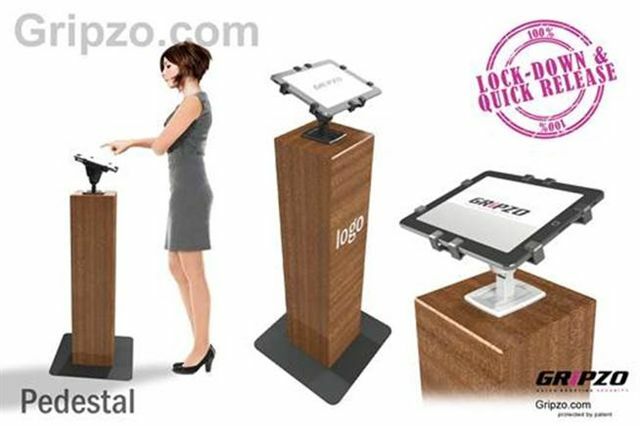 The one size fits all option is also an advantage in case of a tablet change, as the Gripzo fixture can be re-used. This provides a great ROI.